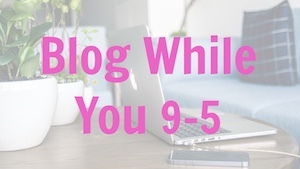 For bloggers who want to grow their side hustle blog while they continue their 9-5 career! I created this course for all the bloggers who aren't ready or willing to give up their day job in order to blog. If you want your blog to be profitable and fulfilling, but you also want to keep your day job, this is the course for you! I've balanced my blog with my full time career as an attorney and I want to show you how you can do juggle it all too - successfully and without driving yourself crazy. If you're tired of hearing about bloggers quitting their jobs and making 6 figures within a few months, then this is the perfect course for you. Yes, it would be great if we all could be doing that, but that isn't a reality for everyone. If literally every blogger was making 6 figures and quitting their jobs... is that even possible? Blogging full time isn’t for everyone. Instead - imagine a life of BALANCE. You can work your day job, spend time with your family and friends, not be stressed AND have a successful blog that you love. This course is for bloggers who want it all - maybe you enjoy your full time job, maybe you're not ready to let go of that income or maybe you just want your blog to be your side hustle. If you've been blogging for awhile and are feeling in a rut, your growth has plateaued or you are struggling to manage your blog side hustle, along with your career, this course is for you. You have a blog, but you also have a very busy life – a job, a house, a family, a dog, kids, friends, hobbies – or all of the above! Life comes first so sometimes you've neglected your blog or you've missed out on great brand partnerships or you've just dropped the ball and lost readership. We've all been there. This course is designed so that you won't feel overwhelmed anymore with managing your blog and your life. 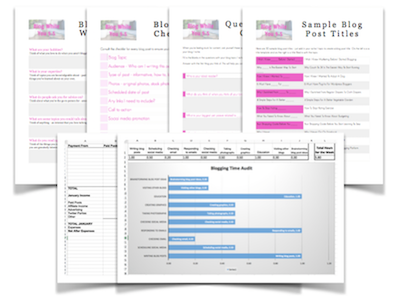 You'll learn strategies on deciding what to blog about, how to always have ready-to-go blog topics, time management, earning money and keeping track of it all. I created this course because I'm a blogger but I'm also a career woman. We all want to know the secret to managing it all. There is no magical formula, but I've developed strategies and systems that work. I've taken my experience as a lawyer (where sticking to goals, time management, the ability to delegate and attention to detail are all key) and brought those skills to my blog and business. As I've invested in my blog, learned the strategies for growth and focused my energy, I've seen my blog traffic explode! 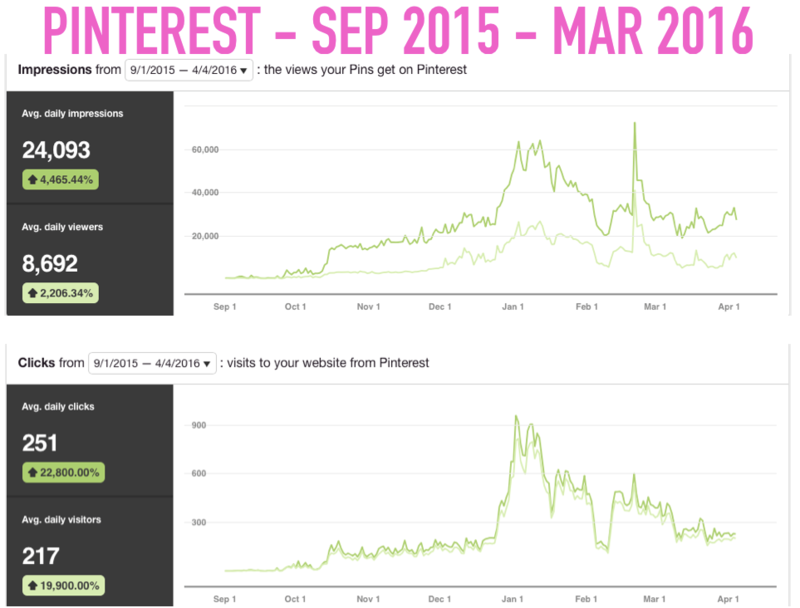 In 6 months time, my blog traffic increased 5 times over. My systems work and I will show you exactly how you can do the same. I've also done all of this while working as a freelance social media manager - so I've actually added MORE to my plate while growing my blog. You don't need to give up your career in order to have a successful blog that is both personally and financially rewarding. 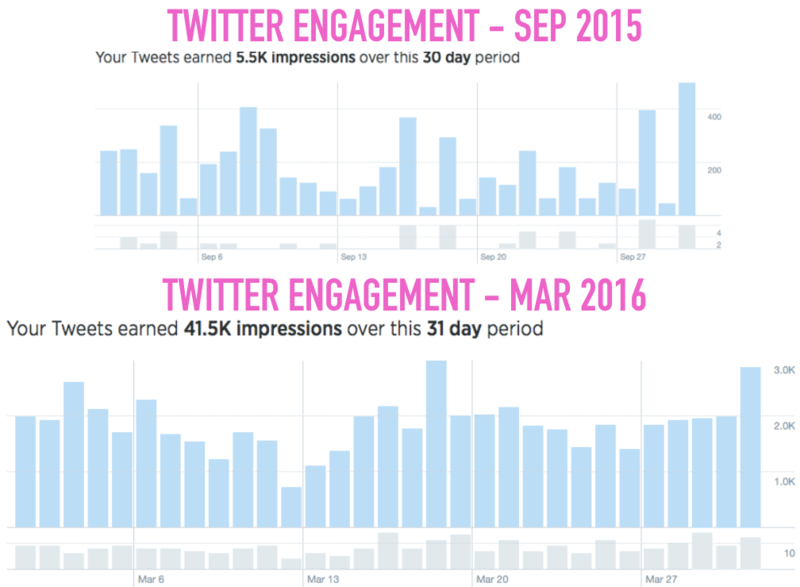 Learn what I have learned in over 5 years of blogging, in just a few weeks! Take the short cut and learn from my successes and failures. I've been there and done it all so you don't have to. It's tempting to think you'll just continue with your blog and "figure things out" as you go along. It sounds easy but it definitely isn't. You need to have specific systems in place to keep your blog improving so that you can expand your reach, work with bigger brands, bring in a side income, collaborate with other bloggers and establish your blog as a sought-out resource. It's time to get your blog organized, streamlined and profitable. This course will teach you how to work smarter, not harder in order to take your blog from hobby to profitable side hustle. Let's do this together. If you have your blog set up, this course is for you, whether you've been blogging for a week or for years. That's because I will help you figure out how to focus your blog, stay organized, balance your blog with your full time job (and other life-worthy duties), stay on a schedule, make money and keep track of it all. Even if you are a brand new blogger, this course will get your blog started on the right foot. Instead of wasting months (or years!) figuring out the best ways to blog, this course will teach how to do it all the right way from the start. And overall how to balance your blog with your full time job and life! I'm new to blogging, been doing it for about 4-5 months now and Blog While You 9-5 was exactly what I needed. I work part time currently, but am seeking a full time job and trying blogging out. The course has inspired me and made me realize it is possible to juggle everything at once! It also motivates me too. I struggled with finding the motivation to carry on because I was trial and erroring everything and It's hard to search for information when you don't know what you're searching for! This course gave me new hope and now I want to continue working on my blog. I am 44% of the way through the course and I'm really inspired and motivated already. Talking Taxes For Bloggers and Small Business Owners - A recording of my webinar all about taxes for bloggers and small business owners. This is the tax information that every blogger needs to know! The 3 Legal Things Every Freelancer NEEDS to Know - A recording of a joint webinar with freelancer Ashley Livingston. Learn how as a freelancer (including as a blogger!) you can protect yourself and your blog from legal issues. A must watch for anyone who makes money freelancing! 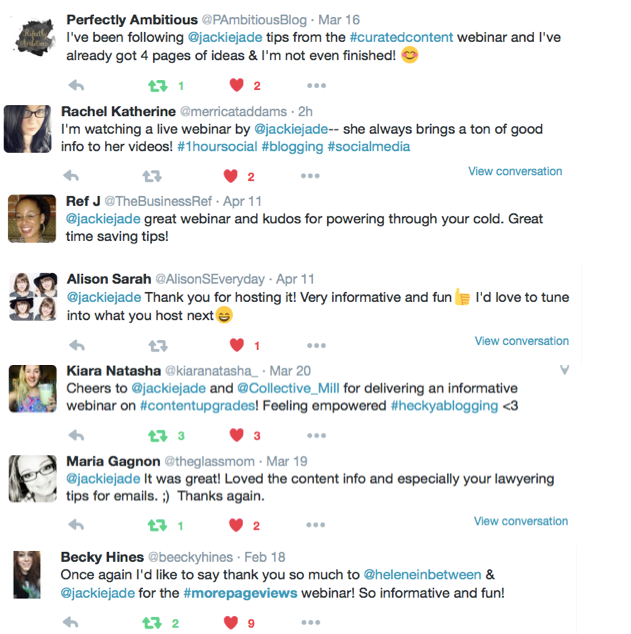 Curated Content - A recording of my webinar about my favorite method for ALWAYS having amazing content ideas ready to go! Social Media Happy Hour - A recording of my webinar about how you can do ALL your social media promotions for your blog in just ONE HOUR a week! Legal Aspects of Blogging - A recording of my webinar as part of the Blogging Blowout conference - the legal basics every blogger needs to know! Running a successful and profitable blog while you work full time isn't impossible - it just takes the right know how. Balancing the 9-5 with the "Everything Else"